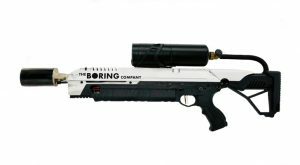 Elon Musk, the founder of Tesla Inc (NASDAQ:TSLA), The Boring Company and SpaceX, is selling a $500 flamethrower. Elon Musk is selling the flamethrowers through The Boring Company. Preorders for the weapons went live over the weekend and Musk has been continuously posting about it on Twitter Inc (NYSE:TWTR). According to Elon Musk, there are 20,000 of the flamethrowers available for purchase. Musk has been updating the preorder numbers on Twitter. His most recent Tweet came late last night. In it, he states that 7,000 preorders have been made for the flamethrowers. Elon Musk continued his joking on Twitter by dismissing rumors that he was planning to create a zombie apocalypse to increase demand for his flamethrowers. He argues that someone would need ” millions of zombies” for an apocalypse. Musk says he doesn’t have a factory big enough for that. Elon Musk has also been Tweeting out jokes about the capabilities of his flamethrowers. In a recent Tweet, he said that the devices are sentient and come with a safe word, which is “cryptocurrency.” He also says each one comes with its own blockchain. To top off Elon Musk’s celebration of flamethrower preorders going live, he changed his bio on Twitter. It now states that he is a “Zombie Defender” and also includes a link to the page for preordering the flamethrowers. Article printed from InvestorPlace Media, https://investorplace.com/2018/01/elon-musk-flamethrowers-are-selling-well/.